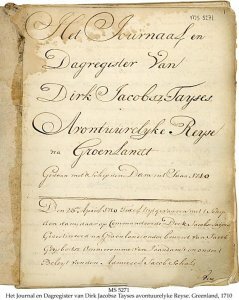 Description	 MS in Dutch on paper, Greenland, 1710, 22ff. incl. 10 blanks, 21x17 cm, single column (19x15 cm), 20-35 lines in cursive script, autograph. Binding	 Netherlands, 1710, marbled paper covers, sewn on 3 cords. Provenance	 1. Captain Dirk Jacobsz Tayses, Netherlands (1710-); 2. G.J. Honig, Zaandijk, Netherlands; 3. Damms Antikvariat, Cat. 665 (Dec. 2004):577. 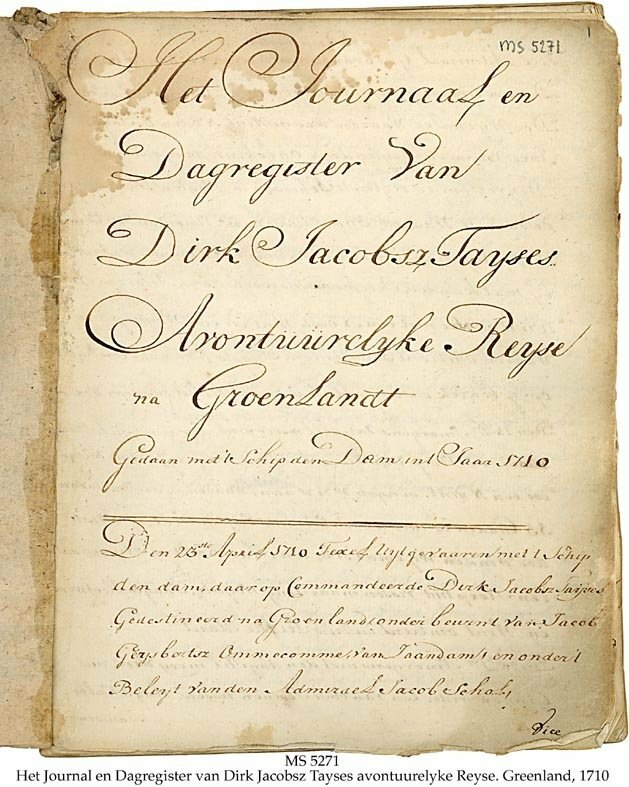 Commentary	 Logbook of sailing ship, den Dam, during its whaling expedition to North East coast of Greenland, April- September 1710, from Belgica Bank at Jakelsbugten (78 degrees 30 min. N) as northernmost point, via Store Koldewey, Wollaston Forland, Shannon, Foster Bugt, Geographical Society Islands, Scoresby Sund, Volquart Boons Kyst, Blosseville Kyst and to Kap Gustav Holm at 66 degres 51 min. where the logbook breaks off, and the ship probably was abandoned after having passed through 7 storms, nearly being screwed down by the ice and grounded.